Why is rural broadband so slow? What are the options for rural broadband? What is the best broadband for rural areas? What is fibre availability like for rural broadband? When will rural broadband get better? Rural broadband refers to broadband connections linking the countryside with the national network. Rural internet services utilise the same technology and the same network as urban areas, so why do we need to differentiate them? It's mainly because of the speed and coverage issues that can plague rural homes and businesses. Ask anyone who lives in the country what the number one downside is and there's a good chance it will be slow broadband. Of all the amazing benefits of country living, it is slow broadband that could stop many more people moving out of our crowded cities. The reason rural broadband is much slower is mainly technical, but money comes into it too. The phone connection on your wall connects to a street cabinet. This in turn connects via a larger cable to your local exchange. The distance between that wall socket and the exchange determines how fast your broadband is. Broadband and telephone signals slow the further they have to travel. So the further your house is from the local exchange, the slower your broadband becomes. A problem in rural areas. Secondly, laying cable is an incredibly expensive business and ISPs can make their money back easily in urban areas with more potential subscribers than in rural areas with fewer potential customers. Faster broadband is made possible through FTTC (Fibre to the Cabinet) technology or FTTP (Fibre to the Premises). It can cost a relative pittance to connect a row of urban houses to FTTC, making it well worth the ISPs while to do it. That same connection could cost many thousands of pounds to link just one or two rural properties and that is often just too expensive. Rural broadband users can choose from a variety of connection technology to get online. This can include the same options as urban areas, but also you’re not dependent entirely on fixed line broadband to give you a decent connection so if connectivity is poor you do have options. This is broadband provided using the Openreach network copper telephone line. It is slower than fibre but uses what is there already. Depending on the distance from your local exchange, it can provide modest broadband speeds. BT and the many Openreach resellers (such as Sky, TalkTalk, EE and Plusnet) offer ADSL connections all around the country. Utilises existing copper telephone wire. Most rural properties already have a phone line. Not the fastest broadband around. Susceptible to contention (too many users at once). Gets slower the further you are from the exchange. Bonded DSL combines two or more ADSL lines to provide faster connections. It can be a viable option if your ADSL speed on a single connection is not fast enough. BT and some resellers offer bonded ADSL in some locations, but it is fairly rare. Offers faster speeds than ADSL. Available in many areas that can use ADSL. Not everywhere has the processing power in the exchange to power it. Not all broadband providers offer this service. FTTC uses fibre optic to the green street cabinet and then existing copper pairs or coaxial connections to your property. BT, TalkTalk, EE, Sky and many others offer FTTC. Virgin Media also uses a similar technology (HFC), though its rural reach is very limited but is increasing gradually. Openreach is rolling out FTTC to rural areas right now. Not available everywhere and won’t be for a while. Still uses slower copper pairs to the home for non-virgin Media connections. Not available if you’re very far from the exchange. Fibre to the Premises is a very fast broadband product but is exceptionally rare (with coverage around the UK currently less than 5%). Some businesses pay for their own connections but these are rare too. The major ISPs and smaller operators like Gigaclear offer FTTP to some rural locations. Very fast broadband connection to your home. Not susceptible to weather or contention. Coverage is sparse and growing very slowly. Limited ISPs offering this service. Can be very expensive to install where it is available. Mobile broadband offers a ray of hope for rural areas both in 3G, 4G and soon 5G in the future. It uses the mobile phone network to provide broadband for phones and computers and requires no expensive cabling. RuralBroadband.co.uk, Three, EE, Vodafone and other networks offer mobile broadband for home use. Faster than many ADSL connections. More flexible than fixed line broadband. Available with a much wider reach than fixed line broadband. Coverage depends entirely on mobile network signal. Contracts may come with less than generous data caps. Satellite broadband uses a satellite dish to send and receive a broadband signal much like satellite TV. If your options are limited, this can provide respite. Companies such as Bigblu offer satellite broadband. Offers connections anywhere in the UK with line of sight to a satellite. Provides decent connection speeds where you would otherwise have none. Significant latency due to how far the signals have to travel. Fixed Wireless Access (FWA) is a way of linking your property to a network wirelessly and then using the fibre core network to complete the journey. It’s the same principle as home Wi-Fi. A wireless device is placed in a central position and customers can connect to it. It then joins the provider network as normal. Providers such as Kijoma offer FWA in Britain, though it's fairly uncommon. Much cheaper to use and install than fixed line. Faster than 4G and ADSL connections in some locations. Wireless is susceptible to weather. There is no ‘best’ broadband for rural locations. Too much depends on your location, the geography, how close you are to a local telephone exchange and what services are offered in your region. Research is essential to identify which is available at your postcode, how fast the speeds can go and what your needs are. The Broadband Genie availability checker is a good place to start as you can quickly see what - if any - fixed line ADSL or fibre optic broadband is in your area. For locations with a good mobile phone signal, mobile broadband is likely cheaper and easier to set up than other options such as satellite or FTTP. You just need an account, a wireless dongle or 4G home router and you’re ready to go. If you have the option for FTTC, FTTP or FWA it may be worth exploring those to overcome the data caps that come with mobile broadband contracts. 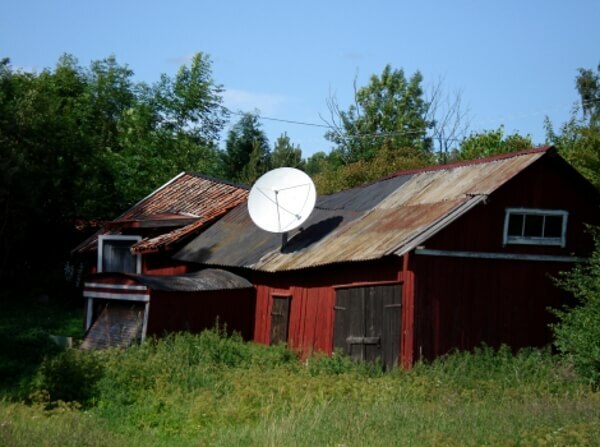 Satellite broadband’s cost makes it only worth considering if nothing else will work. For more information about the advantages and drawbacks see our guide to satellite internet. The headlines typically say that fibre broadband is available to around 95% of UK households. What they don’t say is that remaining 5% are almost entirely rural. Fibre rollout is continuing but progress is slow. Laying cable is very expensive and is a very involved process. If the main ISPs aren’t moving fast enough, you could always try drumming up interest in a community fibre partnership such as B4RN or Gigaclear. These have installed very fast FTTP broadband to rural areas, though they aren’t suitable for individual homes in very remote locations. Getting FTTP to a single home can be very expensive. Unfortunately, we cannot answer this with any degree of accuracy. ISPs are laying cable and improving rural reach but progress is slow. The government has various incentives out there to encourage this but, again, progress is slow. The government’s Universal Service Obligation says every UK household will have the right to demand broadband with a speed of at least 10Mb by 2020, but there is a cost threshold and some homes will have to either pay for the remaining installation fees or turn to alternatives such as satellite broadband. While you’re waiting for ISPs, the government, 5G or something else, there are a few things you can do to make sure your existing line is working to the best of its ability. If you can achieve decent broadband speeds occasionally but then it drops, that is worth investigating as it may indicate a problem with your line. Contact your provider’s technical support team and ask them to run checks. If you have a good 4G phone signal outside your property but not indoors, you can buy signal repeaters that can fix that. These make mobile broadband accessible to those within range and could plug the broadband gap until your area is connected to fibre. Three, EE, Vodafone and other mobile broadband providers offer repeaters that work on their own networks. Mobile broadband performance can also be boosted with an externally mounted aerial to provide better reception. Rural broadband is a slowly evolving picture but is steadily getting better. Even if you don’t yet have the option for fibre or superfast connections, the range of connectivity options is now larger than ever. Hopefully there should be one technology out there to get you connected!